African leopards are a subspecies of leopard known by the scientific name Panthera pardus pardus. They are solitary, arboreal, and nocturnal animals the latter of which perhaps the result of human pressures and hunting. They are one of the strongest predators and can carry twice their weight on their back up a tree. The African leopards' lifespan is around 12 years in the wild. African leopards are sometimes confused with the jaguar. 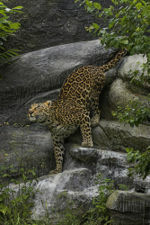 Leopards are spotted, with short round ears, stocky short legs, and a long tail to help them balance in trees. Leopards have very sharp claws to hook into the trees while they are climbing and ripping apart prey. They usually have a light buff or tawny coat. The brown or black irregular circles are called "rosettes". These rosettes cover the whole leopard giving it an excellent camouflage. The color of their fur depends on habitat of the leopard. There height to shoulder is 20-24 inches. There length is 40-50 inches and they weigh around 80-175 pounds. 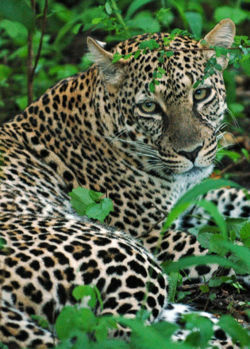 The male leopards are larger than the females. Mating is unseasonal. A leopard's gestation period is between 90-112 days. When the female is in heat hey come together for 6-7 days. The male returns to his territory after this. The female raises the young on her own. Each liter has around 1-3 young. Leopard cubs are hidden for the first two months. The mother takes the cubs hunting when they reach about 4 months. They are taught how to catch small animals. This page was last modified on 7 March 2014, at 20:22.